[prMac.com] Blacksburg, VA - Gotow.net, the creator of NetSketch, is pleased to announce the release of Mathomatic for iPhone. 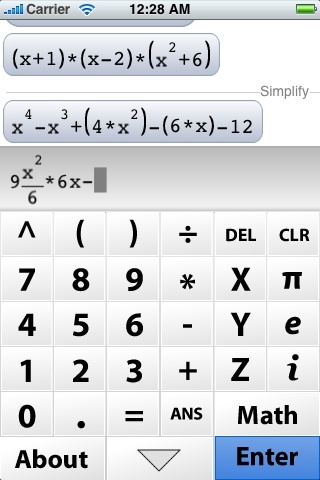 Mathomatic is the first full-fledged symbolic math solution for the iPhone and iPod Touch. More than just a calculator, Mathomatic solves algebraic problems, from simple middle-school homework to complex polynomial and multivariate systems. It sports an attractive, easy-to-use interface fine tuned for the iPhone. Scroll through recent output, tap expressions to select and re-use them, and "flick" through long inputs. After a few days, you'll find yourself trying to tap through the output on your graphing calculator! Mathomatic makes a great companion for anyone who wants to speed through complex equations. It solves systems of equations, showing intermediate steps and all possible solutions. It simplifies and factors expressions, computes derivatives, indefinite integrals, laplace transforms, taylor series expansions, and more! Imaginary numbers are fully supported, and complex expressions are beautifully formatted, much like the output of high-end desktop mathematics applications. So whether you need to solve a system of equations or just check your homework, look no further! Powered by an open-source desktop solution that has been in development since 1986, Mathomatic for iPhone offers the features of a traditional symbolic math suite on your mobile device. Mathomatic is $1.99 (USD), and is available for immediate download on the iTunes App Store. For a free promotional copy of Mathomatic 1.0 and more information about the app, contact Ben Gotow. The desktop version of Mathomatic is an open-source computer algebra system maintained by George J. Gesslein II. For more information about the project, visit their website. Gotow.net is a creative studio offering web development and programming services, in addition to software for the Mac OS and iPhone. Copyright 2008 Gotow.net. All Rights Reserved. Apple, the Apple logo, iPhone and iPod Touch are registered trademarks of Apple Computer in the U.S. and/or other countries.